The other day we completely filled our page with random objects. Today, we will be filling our entire page with a pen this time!! This prompt is definitely time consuming but also definitely worth it. Journal Prompt: Completely fill your page with line design! Line design and geometrics have complete consumed my inspiration boards for awhile now. The simple, yet complex designs are so aesthetically pleasing for me. 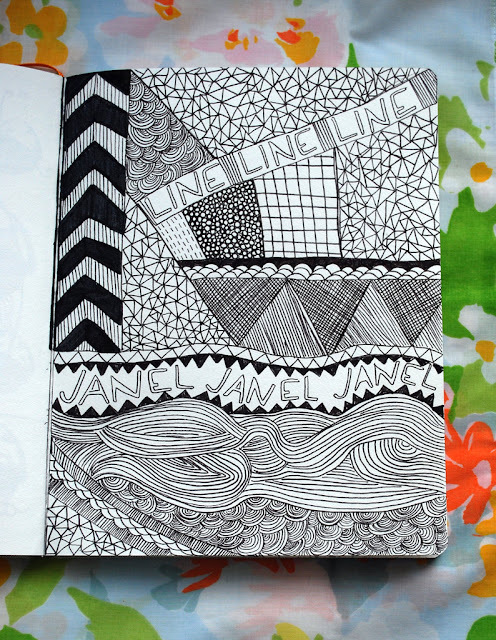 Have fun trying out line design, patterns, and geometric shapes on your page today. A lovely page to look at. Make yourself comfortable for this one friends!! Yay! this is my favorite kind! Fully appreciate the time this took!